Such was the scathing report issued by Rakesh Mohan, Director of Idaho’s Office of Performance Evaluations, to the legislature today on the current state of dysfunction regarding Schoolnet, Idaho’s Instructional Management System. Unfortunately, this particular project’s lead author Lance McCleve was ill and unable to brief the members of the committee himself resulting in minimal details being presented today. The committee calling for an additional meeting to go over the results, in full, at a time to be determined in the future. While many details were not shared in the presentation today, the full report is available online through the Office of Performance Evaluation. Be prepared: it’s enough to make your blood boil in a tale of near total Deja vu in comparison to Schoolnet’s companion ISEE. If you haven’t read the details of that report either, it’s worth a look. Mohan advised committee members that the original project was meant to be utilized at the district level, not the statewide level. Unfortunately, the ISDE asked that the product be redesigned so be useful at the statewide level which caused many of the problems resulting in the current dysfunctional state. To be fair, Pearson, the vendor hired to fulfill the product, also deserves partial ownership of this problem. Starting in 2012 the Dept. of Ed began an ongoing correspondence with Pearson regarding multiple glitches in the software that was hampering districts ability to utilize the program. The Department of Ed set a deadline of June 2013 for all glitches to be corrected; unfortunately, that deadline came and went with many problems still plaguing the system. 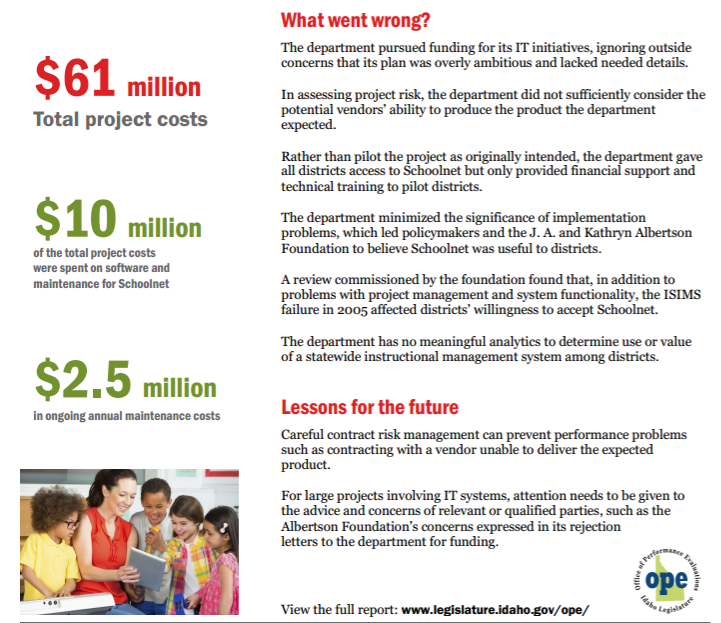 The report indicates that 10 million dollars was paid to Pearson for a product that pretty much never worked and isn’t utilized by most districts in the state. Good stuff. He also informed legislators that the State Department failed to train districts that did not participate in the pilot project; in other words, most districts in the state had no idea what the system was, how to use it, or who to call if there were problems. Sounds like a surefire recipe for success! Rep. Rusche was particularly flummoxed and asked that additional investigation be conducted into the Idaho Dept. of Education’s handling of Schoolnet to seek and demand accountability for the botched results. He was particularly dissatisfied that the Dept. of Ed and the Governor’s office had not already conducted their own investigations into the mismanagement. Many districts have abandoned using the project, and it is unclear what the future for the system is; Mohan indicated that the current administration would likely be “scaling back” the system, though there were no details in what that would look like. Stay tuned for an update when the committee sets a date to reconvene and go over the results of the report with the lead author.